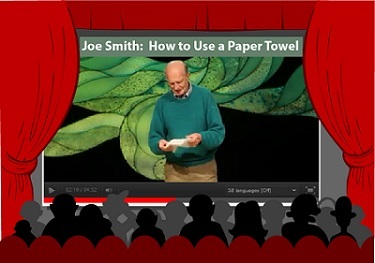 In this English learning activity, Joe Smith gives instructions on how to properly use paper towels to dry our hands. If you are like most people, chances are good that you use more than one paper towel to get your hands dry. The end result: loads of wasted paper, which we know is terrible for the environment. I must confess that my own paper towel usage has gone down dramatically since watching this video. Joe Smith’s technique really works. Even if you’re not guilty of this offense, I still recommend you watch the video because Joe’s an entertaining speaker. He’s an American who lives in the state of Oregon, a state where people are conscious about protecting the environment. Okay! Are you ready to practice English and learn how to help the save the planet one paper towel at a time? It’s really easy. 2. Take the quiz to test your comprehension. 3. Read the transcript for further practice. 4. Watch the video again with the translation in your language if you need additional help understanding the video. The video is currently translated in 38 languages! 5. Leave comments on what you think about the video. 6. “Rinse and repeat” (= do the steps over again) if you want additional practice. You can also watch this video on TED's website by clicking here. Let's see what you were able to understand. This is a really short quiz to check your understanding of the video. Joe Smith (JS): Five hundred seventy-one million two hundred thirty thousand pounds of paper towels are used by Americans every year. If we could—correction, wrong figure—13 billion used every year. If we could reduce the usage of paper towels, one paper towel per person per day, 571,230,000 pounds of paper not used. We can do that. Now there are all kinds of paper towel dispensers. There's the tri-fold. People typically take two or three. There's the one that cuts it, that you have to tear off. People go one, two, three, four, tear. This much, right? There's the one that cuts itself. People go, one, two, three, four. Or there's the same thing, but recycled paper, you have to get five of those because they're not as absorbent, of course. The fact is, you can do it all with one towel. The key, two words: This half of the room, your word is "shake." Let's hear it. Shake. JS: Your word is "fold." Click here for the full transcript and instructions for how to see the translation. Now’s your turn to practice your writing skills! Remember that repetition and practice are keys to improving your English. Take a moment to share what you thought of the video. It's super easy. Just fill in the form below. Share Your Thoughts About Joe Smith's TED Talk! 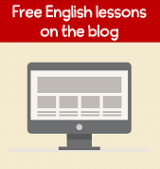 Now it’s your turn to practice your writing skills. What do you think of Joe’s “shake and fold” technique? How many paper towels do you usually use? Do people in your country waste a lot of paper? Did you enjoy this talk? Have other comments? We'd love to know what you think!